Don’t hire family members or friends. If something goes wrong, it will ruin a good relationship. Most homeowners believe the first thing to do when they’ve decided to remodel is to have a contractor come to their home. This is a waste of time and effort, unless the contractor that you’re calling is a design-build firm (a contractor with design employees). Unfortunately, most homeowners also expect a detailed preliminary estimate, in writing, after a two-hour evening appointment with the contractor (and no plans). If you’re “testing the water” to see if your proposed project is feasible, you can do it by telephone. Call three to five contractors, no more than that. It will be hard to remember what they said (unless you took copious notes or recorded the conversation). 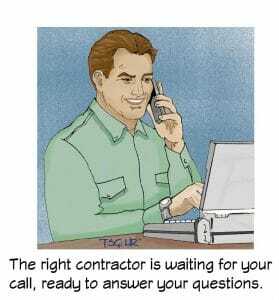 The contractor may have questions for you about your project. The first question a general contractor will ask when you call is, “Do you have plans?” Without plans, your project is just a verbal wish for the future. He or she will ask other questions about your project, including how much you want to invest and when you want your project finished. Based on the “preliminary” information, ask if the contractor can (and will) give you a budget range during your phone conversation, based on his/her experience, or if he/she wants to set an appointment. In the second half of this article, we’ll explore what happens at the first face-to-face meeting in your home, and the logical steps until you decide to hire your contractor. Both articles are revised excerpts from “THE Survival Guide: Home Remodeling”.